OctoRose Royalty Custom Waterfall Window Valance and Swags & Tails 132x47"
Home | Window Treatment | Window Curtain Valance | OctoRose Royalty Custom Waterfall Window Valance and Swags & Tails 132x47"
* This beautiful and stunning window treatment is made from a lovely silk taffeta with beads trim. * 2.5 inch curtain rod pocket on top. Subtle in fabric design, this satin curtain set creates a dreamy look that is desirable in any room of the house. The contrasty beads tassel fringes finish adds the perfect finishing touches to this functional piece of art that will be the central focus of any room. 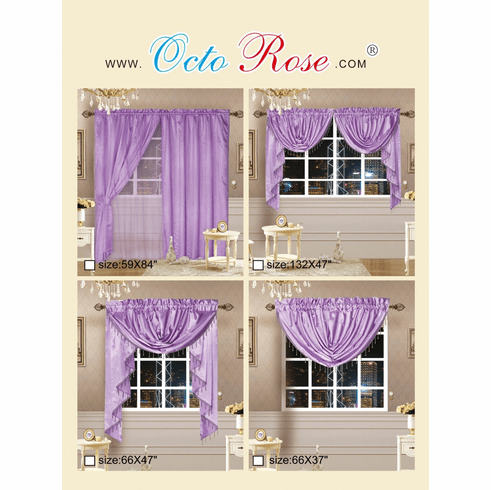 Enjoy the premium quality gorgeous looking valance with swags and pair of tails. One panel window: select "small window valance". 2-3 panel window: select "pair of swags & tails" Plus "1pc of swag". 4-5 panel window: select "pair of swags & tails" plus "3pcs of swag"
each window panel around 40" width.